Trader’s Way, a prime online Forex and CFD broker, here offers you Technical Market Outlook by Kate Curtis, the company’s expert with deep trading and analysis experience. NZD/USD is still on a strong downtrend, as seen from the formation of a falling trend line on the 1-hour time frame. The pair has also just broken below the .8300 major psychological support earlier this week, confirming the strong bearish bias on this pair. After consolidating around the .8250 minor psychological level at the start of the week, the pair is pulling up for a quick retracement before possibly resuming its downtrend. It just rallied past the 38.2% Fib level but appears to be finding resistance at the 50% Fibonacci retracement level, which is in line with a former support area. However, the trend line is still a few pips higher than this resistance zone while stochastic hasn’t crossed down from the overbought area yet. This suggests that the pair has enough room to climb before actually selling off. The 61.8% Fib seems to be a better entry point in this case. Shorting around .8350 with a stop above the .8400 major psychological level and a target of .8200 would yield a 2:1 reward-to-risk ratio. Another retracement opportunity is presenting itself on EUR/USD’s 1-hour time frame as the pair has been stalling above the 1.3000 major psychological level. Drawing a trend line connecting the highs of the price shows that the potential test level is at 1.3100-1.3150. US sequestration has been weighing on riskier currencies so far while Italian politics is adding further selling pressure on the euro. The ECB is set to make its monetary policy decision later on this week and, even though no interest rate cuts are expected, further LTRO issues could be possible. After all, ECB President Mario Draghi has already expressed his openness to further easing during his speech last week. The Fibonacci retracement tool shows that the 38.2% Fibonacci level is in line with the 1.3100 major psychological resistance while the 50% Fib is close to the 1.3150 minor psychological resistance and falling trend line. Shorting in this area and putting a stop above the 61.8% Fib, which would be above the trend line, would give the short trade enough breathing room. As for targets, the 1.3000 mark seems to be solid support at the moment but this could depend on what the ECB does during its monetary policy decision. The AUD/USD pair has been trading cautiously around the support zone from 1.0150 to 1.0200 for the past few days, as traders waited for the monetary policy decision from the Reserve Bank of Australia. During the actual statement today, the bank decided to keep rates on hold at 3.00%, as Governor Stevens maintained that the RBA’s recent easing efforts are just starting to take effect. From a technical standpoint, a hammer candlestick pattern has formed on the daily time frame right on the 1.0150 support level. This indicates that the recent selloff, which was mostly a result of pricing in rate cut expectations, is already over and about to reverse. Right after the rate statement, the pair jumped back above the 1.0200 level and appears ready to trade even higher. A bullish divergence has also materialized on the daily chart as the price made lower lows, while stochastic made higher lows. Now that stochastic is moving out of the oversold area, Aussie bulls could push the pair right back up to the top of the long-term range around 1.0600. Going long at 1.0250 until 1.0600 with a stop below the 1.0150 level would be a 3.5-to-1 reward-to-risk ratio. GBP/USD has been forming its usual Asian box consolidation prior to the Bank of England interest rate decision. Strong breakouts typically take place during the actual event and the direction depends on the central bank’s rhetoric. Recall that the minutes of the previous monetary policy meeting showed that BOE Governor Mervyn King shifted his stance to a more dovish one as he voted to increase asset purchases back then. However, the hawks still outnumbered the doves at that time, which explains why there was no actual change in monetary policy. This time around, King could vote in the doves’ favor once more and probably convince a few more policymakers to push for further easing. If that’s the case, GBP/USD could make a strong breakdown from the 1.5000 major psychological level and sell off by at least a hundred pips, depending on the size of asset purchases. On the other hand, if there aren’t enough votes to increase the BOE’s asset purchase program, GBP/USD could spike to the upside during the rate statement. This initial rally might not last very long though as the lack of easing this time could increase the odds of further easing next time. After all, the UK is facing the possibility of a triple-dip recession and has been printing weak economic data lately. A short trade at 1.4980 until the 1.4800 area or lower with a tight stop above 1.5000 would yield a pretty high reward-to-risk ratio, good enough for a day trade. Stochastic is in the overbought region, suggesting a further move down, while the 1.5000 major psychological support has already been breached. If price spikes higher during the BOE decision though, possibly because of lack of action or hawkish remarks from incoming head Mark Carney, fading the rally from 1.5050-1.5100 back to 1.5000 could also work as a short-term trade. The falling trend line on EUR/USD is still intact for now as the pair is currently testing the 1.3100 major psychological level. That area is in line with the 38.2% Fibonacci retracement level, which might act as resistance today. There are no major economic releases from the euro zone today but the ECB Governor Mario did talk about downside risks to growth during the central bank’s recent monetary policy decision. The ECB did keep rates on hold though and didn’t announce any changes to its current stimulus programs, and this allowed EUR/USD to bounce back to 1.3100 later on. However, 1.3100 might be the line in the sand for the euro’s rallies in the near term as the sentiment in the region is still downbeat. After all, there is a lot of political uncertainty in Italy at the moment and this places the country’s debt situation in jeopardy. In a nutshell, the ECB rate statement was slightly more upbeat than expected as Draghi focused on the potential economic rebound that the central bank is projecting to happen later in the year. This could continue to provide support for the euro today. However, the main event risk for this pair is the U.S. non-farm payrolls report due 1:30 pm GMT. The labor report could show a 162K increase in hiring for February, which could keep the jobless rate steady at 7.9%. A stronger than expected figure could give the U.S. dollar a boost as the Fed is closely watching the jobs figures as part of their consideration in withdrawing monetary stimulus. A weaker than expected figure could trigger a U.S. dollar selloff and push EUR/USD above 1.3100 and the trend line as this would mean the U.S. economy might have trouble withstanding the future job cuts entailed by sequestration. If you’re expecting the downtrend to continue until the end of the week, shorting at 1.3100 with a 50-pip stop and aiming for the 1.3000 handle would be a 2:1 trade. But if you’re expecting an upside breakout, wait for a bit of momentum around 1.3125 with a stop below the 1.3100 mark. Last Friday’s NFP release, which came in stronger than expected, pushed EUR/USD back to the 1.3000 major psychological level. This support zone seems to be holding at the moment as stochastic reached the oversold region and started to move upwards, suggesting a potential bounce back to the top of the range or at least until the middle. There are no major economic reports due from the euro zone today so there’s no catalyst for a convincing break below the 1.3000 handle. Keep in mind though that the U.S. NFP was released during the New York session on a Friday, which means that Asian and London session traders have yet to price in their reaction to the data. A significant amount of dollar-buying could set off a break below the bottom of the range, especially when the euro zone suffers a bout of downbeat political updates from Italy. 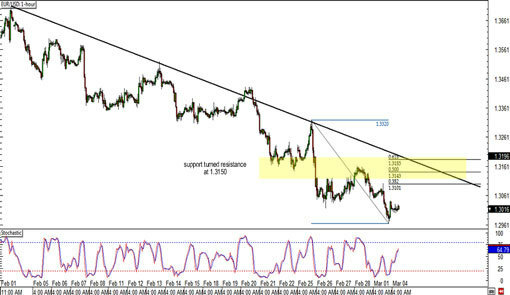 EUR/USD could keep trading around the bottom of the range but could be due for a bit of correction as traders take profit off their short trades from last week. If that’s the case, the pair could bounce back up to the 1.3050 minor psychological level around the middle of the 150-pip range. Going long at 1.3000 with a stop below 1.2975 could yield roughly a 2:1 reward-to-risk, good enough for a day trade. Cable has been on a downtrend for the past few weeks and has recently made a strong break below the 1.5000 major psychological support level. This confirms that the selloff is really strong and that the pair could be on its way to test the 2010 lows around 1.4300. At the moment, the pair is trading inside a falling channel on the 1-hour time frame so there could be an opportunity to catch a quick pullback when joining the overall downtrend. The 1.4950 minor psychological level is located at the middle of the range while the 1.5000 handle is at the top of the range, both of which could act as solid resistance levels for the week. Only medium-tier reports are due from the U.K. today and these could push GBP/USD to pull back a little before resuming its drop in case the actual figures come in better than expected. U.K. manufacturing production is expected to stay flat in January after rising by 1.6% in December while U.K. trade balance is estimated to show a smaller deficit of 8.8 billion GBP from 8.9 billion GBP. Shorting around 1.4950 with a stop above 1.5000 would yield more than a 2:1 reward to risk ratio if you’d aim for the previous lows around 1.4850. GBP/USD has just broken below the 1.5000 major psychological level in the past week but the pair appears prime for a retest within the day. Using the Fibonacci retracement tool on the recent swing high and swing low to the 1.4820 area reveals that the 1.4975-1.5000 levels are in line with Fibs. In addition, stochastic has made a bearish divergence on the 1-hour time frame as the oscillator made higher highs while price made lower highs. Stochastic is still in the overbought region and hasn’t crossed down yet, which suggests pound bulls could still be in control at the moment. A cross down from the overbought region will show that sellers have gathered enough momentum to keep the downtrend going. Yesterday, the U.K. printed a very weak manufacturing production report which showed a 1.5% decline for February. This was way below the consensus of a flat reading for the month. However, the trade balance came in stronger than expected as it showed a deficit of 8.2 billion GBP, smaller than the estimated 8.8 billion GBP shortfall. No reports are due from the U.K. today but the U.S. retail sales due 1:30 pm GMT could provide enough volatility for this pair. The headline figure is expected to rebound by 0.5% in February while the core version of the report could print a 0.5% uptick as well. Take note that the recent NFP report printed a strong upside surprise for the same month and that improvements in the jobs sector usually result in a surge for consumer spending. Positive data from the U.S. has been lifting the Greenback so far, which suggests that a potential cable selloff could take place if the report meets or beats expectations. NZD/USD got sold off strongly after the RBNZ announced its interest rate decision during today’s Asian session. Even though the central bank kept rates on hold at 2.50% as expected, RBNZ head Graeme Wheeler commented that domestic economic activity is weak. A couple of reasons that he mentioned for this slowdown were the worsening drought conditions and the strength of the New Zealand dollar. In fact, he pointed out in his speech a few hours later that he thinks the New Zealand dollar is overvalued by 10-15%, prompting traders to speculate that the RBNZ will engage in currency intervention if the Kiwi doesn’t return to their desired levels. If you missed the initial reaction to the report, there’s still a chance to catch the rest of the move as European traders and U.S. session traders have yet to react to the news. Based on past price action following the RBNZ statement, NZD/USD typically makes a strong reaction right after the event then consolidates at the start of the London session, after which it makes a breakout in the same direction. At the moment, NZD/USD is moving below the .8200 major psychological level and is consolidating around .8175, suggesting a potential breakdown later on. The selloff could last until the next minor psychological level of .8150 or possibly until the .8100 major psychological support. Take note that the U.S. is set to release its PPI and initial jobless claims later and that stronger than expected results typically boost the U.S. dollar. Shorting at the break of .8175 with a stop above .8200 and a profit target around .8100 would yield a good reward-to-risk ratio for a day trade. After yesterday’s short squeeze on EUR/USD, which pushed the pair back above the 1.3000 major psychological support level, many are wondering if the rally of this pair would actually last. It seems that it could find resistance at the top of the falling channel drawn on the 4-hour time frame at least for the end of this week. Take note that the top of the channel is close to the 1.3050 minor psychological level, which could act as resistance for EUR/USD. This area also acted as an area of interest in the past, and the lack of good news from the euro zone or any major market catalyst for today could keep the pair’s rallies at bay. Of course, don’t forget that the European Union Economic Summit is going on today until the start of the weekend, which suggests that there is still some event risk. Also, the U.S. is set to release a bunch of reports, namely the CPI, Empire State manufacturing index, and University of Michigan preliminary consumer sentiment report during today’s New York session. Shorting at the top of the channel with a stop above the 1.3050 line in the sand could provide a decent 2:1 reward-to-risk ratio for a day trade if you’re aiming for the bottom of the channel or just the 1.3000 major psychological level. EUR/USD made a huge gap down from the 1.3100 area to below 1.3000 over the weekend. The sudden rally that took place during the last two trading days of the previous week can be explained by a quick short squeeze as traders decided to book profits around the pair’s previous lows. However, sentiment for the euro zone remains negative as the pair opened this week right where it was prior to the short squeeze. Before the pair trades any lower though, traders could take advantage of this potential gap close back to the 1.3050 minor psychological resistance. There’s a falling channel on the 4-hour time frame, right where the pair closed last week. A short trade on a pullback to the 1.3000 or 1.3050 area with a stop above 1.3100 and a target around the pair’s previous lows could work for today as the euro zone has no major catalysts on schedule. USD/CAD is currently consolidating above the 1.0150 minor psychological support level as traders await the release of the monthly GDP reading for January. The figure is expected to rebound by 0.1% from the -0.2% reading seen last December. A stronger than expected reading could trigger a downside breakout to the next support level around 1.0115 or possibly until the 1.0100 major psychological level, depending on how positive the actual reading is. On the other hand, a weaker than expected figure could trigger an upside breakout by USD/CAD. This could push the pair back to the 1.0200 major psychological level, which has acted as support in the past. The pair is once more testing the 1.5200 major psychological resistance for today. The level has held earlier this week as price dipped back to the 1.5100 major psychological support afterwards. There’s a bearish divergence that formed on the hourly time frame as the price made lower highs while the oscillator drew higher highs. Stochastic is already moving down from the overbought region, suggesting that pound bears have already found momentum to push the pair down. The pair could once more find support at the 1.5100 area, which has been holding for the past couple of weeks. Stronger profit-taking moves could push the pair even lower to the 1.5000 mark. USD/JPY sold off for the past couple of weeks and is now testing the former resistance at the 94.00 major psychological level. The pair seems to be finding support around this area, which is also in line with the 50% Fibonacci retracement level on the 4-hour time frame. Take note that the BOJ is set to make its interest rate decision later this week but traders could start pricing their expectations way ahead of the actual event. In his previous speech, Kuroda noted that the central bank is ready to implement the necessary quantitative and qualitative measures, the details of which haven’t been disclosed yet. Kuroda might’ve simply been waiting for BOJ policymakers to convene first before announcing concrete steps, but additional asset purchases are eyed. The yen could sell off as the event draws nearer and nearer. In the meantime, the U.S. is set to print its ISM manufacturing PMI during today’s U.S. session. An improvement over the previous month’s figure could boost the U.S. dollar against the yen. Stochastic is making its way out of the oversold region, which suggests that dollar bulls currently have the upper hand. If you plan to buy this pair, make sure you set your stop below the 61.8% Fib level. Thanks to its recent rallies for the first few trading sessions this week, EUR/USD was able to pull up to the former support level around the 1.2850 minor psychological handle. This is closely in line with the 38.2% Fibonacci retracement level on the 1-hour time frame. In addition, stochastic appears ready to drop down form the overbought region, suggesting that euro bears are about to have the upper hand soon. If that’s the case, EUR/USD could head back south until its previous lows around 1.2775. There are a few minor market catalysts on tap from the euro zone for today. The German preliminary CPI, Spanish employment data, and Italian manufacturing PMI are all on tap and these could provide some volatility for euro pairs. Weaker than expected figure from these top economies in the region could weigh on the euro. Shorting at the 1.2850 area and aiming for 1.2775 with a 25-pip stop could be a 3:1 trade. Aiming lower could yield a better reward-to-risk ratio but this might require you to hold on to the trade until after the U.S. session. There are no top-tier reports on tap from the U.S. today, which suggests quiet trading during the New York market hours. The recently released manufacturing PMI for the United Kingdom sparked a massive selloff for the pound as the actual figure missed expectations. Take note that the BOE is currently watching business surveys very closely before they make their interest rate decision. For today, the UK still has the construction PMI on tap and another disappointment could trigger another round of pound selling. The figure is expected to improve from 46.8 to 47.7, still indicating a contraction in the industry. On the shorter-term time frames, GBP/USD shows tight consolidation around the 1.5100 handle as traders await the release of today’s set of data. A short below the Asian box around 1.5075 and aiming for the 1.5000 handle will be a good day trade if the construction PMI misses expectations. On the other hand, going long above 1.5100 if the actual report comes in strong could also be a good day trade if price rallies back to 1.5150 or 1.5200 afterwards. After making a strong selloff from the 1.5250 minor psychological resistance and previous week highs, GBP/USD found support around the 1.5100 major psychological level. The pair appears to be retracing, thanks to the recent disappointments in U.S. economic data. The pair seems to be encountering short-term resistance at the 38.2% Fibonacci retracement level, which is close to the 1.5150 minor psychological mark. However, stochastic is in moving out of the oversold region, suggesting a potential move up. Take note though that the BOE is scheduled to make its interest rate decision during today’s London session and possibly highlight the weaknesses in the British economy. If that’s the case or if they hint at further asset purchases later on, GBP/USD could stage another strong selloff, possibly below the previous lows. Note that there’s a double top formation on the 1-hour time frame, which suggests a reversal of the recent uptrend. The neckline is located around 1.5100 and a strong break below this area would confirm the start of a downtrend. This could carry on until the previous lows near 1.4850. On its 4-hour time frame, AUD/USD has formed a double top formation as it failed to break past the 1.0500 major psychological resistance over the past few weeks. The neckline of the pattern is at the 1.0400 major psychological support, which could hold or break depending on the outcome of the NFP report. Weaker U.S. jobs growth is eyed for March as the ADP non-farm employment change figure and Challenger job cuts data both posted bleak results. Sequestration efforts may have also started to kick in during the month, which might mean more government layoffs for the period. The NFP report is expected to show a 198K reading. A stronger than expected figure could provide a boost for the U.S. dollar, which could trigger a downside break for AUD/USD. Take note that the pattern is 100 pips in height, which suggests that the breakdown could last until 1.0300. On the other hand, a weak figure could lead to a dollar selloff, which might push AUD/USD back to the 1.0500 area or to the top of the longer-term range at 1.0600. A 100-pip stop should provide enough leeway for the trade as volatility could spike during the actual release. If you’re not comfortable setting positions ahead of the event, wait for momentum to dictate price action before entering orders. This is my personal view on the above update. Trader should follow their own assumption.